From the subtropics northwards over the northern North Atlantic and Nordic Seas, the status of the marine environment during WOCE is overwhelmingly determined by the extreme long-term behaviour of the NAO. As described earlier (Section 7.3.2.2), the WOCE field phase occurred at a most unusual interval in the climatic history of the North Atlantic, at the end of a period in which the principal atmospheric forcing mode in that sector had amplified over three or four decades to its most extreme positive state (generally) in a 176-year instrumental record and possibly much longer. In the present context, the importance of this extreme climatic shift lies in the wide range of variables attributed to the changing NAO, which have the potential to cause change in the marine environment. These include variations in wind speed, latent and sensible heat flux (Cayan, 1992a,b,c), evaporation/precipitation (Cayan and Reverdin, 1994; Hurrell, 1995a), the distribution, prevalence and intensity of Atlantic storms (Rogers, 1990, 1994, 1997; Hurrell, 1995b; WASA Group, 1997; Alexandersson et al., 1998), hence effects on the wave climate (Bacon and Carter, 1993; Kushnir et al, 1997; WASA Group, 1997; Carter, 1999; Cotton and Challenor, 1999), sea surface temperature (Cayan, 1992c; Hansen and Bezdek, 1996), the strength of the Labrador Current (Myers et al., 1989), the characteristics and distribution of water masses (Lazier, 1995; McCartney et al., 1996, 1997; Houghton, 1996; Joyce and Robbins, 1996; Molinari et al., 1997, Sy et al., 1997; Joyce et al., 1999; Curry et al., 1998; Curry and McCartney, 2001), the extent of the marginal ice zone (Fang and Wallace, 1994; Mysak et al., 1996; Deser et al., 2000), Davis Strait ice volume (Deser and Blackmon, 1993), the iceberg flux past Newfoundland (Drinkwater, in Rhines, 1994), and the intensity of deep convection at the main Atlantic sites (Greenland Sea, Labrador Sea and Sargasso; Dickson et al., 1996; Talley, 1996b; Dickson, 1997; Joyce et al, 2000). Fig. 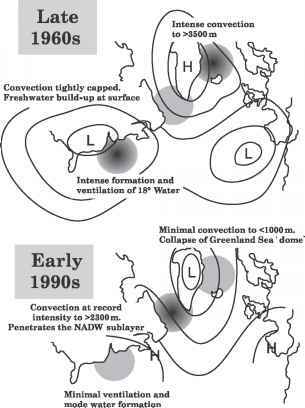 7.3.5 Schematic description of changes in the distribution of winter convective activity in the North Atlantic during contrasting extreme states of the NAO (low index 1960s, high index 1990s). A representative mean pressure anomaly field is indicated for each case. From Dickson (1997). 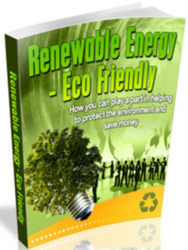 Reprinted with permission from Nature 386, copyright 1997, Macmillan Magazines Limited. but vertical exchange in the Labrador Sea is reaching deeper than previously observed (Fig. 7.3.5). The mechanism is thought to involve the sort of change in the distribution of Atlantic winter storm activity that has long been associated with opposite extreme states of the NAO (Rogers, 1990). From the late 1950s to 1970, under the more-southerly of its two main cells, a regime of cold winter air temperatures and extreme snowcover greatly enhanced the land-sea temperature gradient at the US eastern seaboard, spinning-up more storms than normal offshore (Dickson and Namias, 1976; Hayden, 1981) and causing them to develop more rapidly to occlusion in a narrow band following the main coastal baroclinic gradient. The local effect was to focus the centre of maximum storm activity off the US eastern seaboard where the cold, stormy conditions caused maximum formation and ventilation of the Eighteen-Degree Water pycnostad, and some increase in its density (Jenkins, 1982; Talley and Raymer, 1982; Talley, 1996b). The remote effect was to reduce stormi-ness over the Labrador Sea to a post-war minimum in the 1960s, so that Labrador Sea convection became increasingly suppressed and fresh water built up at the surface (Lazier, 1980, 1988, 1995). LSW production resumed abruptly in winter 1971-72 with a rapid removal of the surface freshwater accumulation by vertical spreading as the cold winter regime ended at the US east coast and intense, chill northwesterlies and storminess returned to the Labrador Sea. Since then the tendency has been towards intensifying and deepening ventilation of the Labrador Sea, with a progressive cooling and freshening of LSW into the WOCE period of the 1990s, and ultimately, during the deepest-reaching convection since 1992, an increase in LSW density as convection began to excavate the cold but saline sublayer of North Atlantic Deep Water (Dickson et al., 1996). It is this cold, fresh, and dense new vintage of LSW that Sy et al. (1997) use, together with its chlorofluorocarbon (CFC) signature, to derive modern estimates of LSW spreading rates within the Labrador-Irminger Basin that are an order of magnitude greater than published values, and transocean spreading rates at LSW depths that are three or four times faster than previous estimates (e.g. Read and Gould, 1992). 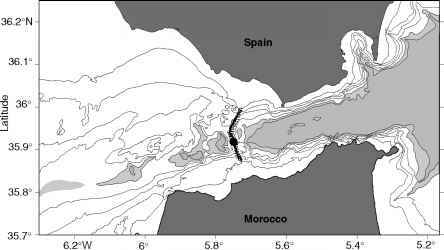 Changes in the formation and renewal of these vertically homogeneous mode waters are important in their own right in carrying the signal of climatic change to intermediate and greater depths and from there, by horizontal spreading, throughout the ocean basin. And the changes in the characteristics of LSW have certainly been remarkable. In the early 1990s, thus including much of the WOCE field phase, LSW was fresher, colder and denser than at any other time in the history of deep measurements in the Labrador Sea (Fig. 7.3.6 a-c, see Plate 7.3.6a-c, p. 588). From 1966 to 1992, the overall freshening of the water column of the Labrador Sea was equivalent to mixing in an extra 6 m of fresh water at the sea surface (7 m if we extend the period to 1994), and its cooling has been equivalent to a loss of 8 Wm—2 continuously for 26 years (Lazier, 1995). Beneath the convective layer, the freshening by ~ 0.01 per decade over the past three to four decades (apparently still continuing) reflects the recent large-scale freshening of the upper Nordic Seas (Section 7.3.6, below), passed on by the dense northern overflows through Denmark Strait and the Faroe Bank Channel (see Saunders, Chapter 5.6). As the net result of these changes, the steric height in the central Labrador Sea in the mid-1990s was typically 6-9 cm lower than in the late 1960s. As already described, these changes have a value in tracing out the rates and pathways by which LSW-spreads across the basin. However, the major importance of these changes is likely to lie in their influence on the Atlantic gyre circulation itself. As Curry and McCartney (2001) point out, the main North Atlantic Current is driven by the gradient of potential energy anomaly (PE') across the mutual boundary between the subtropical and subpolar gyres. Since PE' reflects the vertical density structure and heat content of the upper ocean to well below the wind-driven layer, it follows that coordinated changes of opposite sign in the production and characteristics of the mode waters in each gyre will have the potential to drive deep-seated changes in the PE' gradient, and hence in the strength of the Atlantic gyre circulation. If these changes in the density and heat content of mode waters are attributable to the NAO, then the amplification of the NAO to extreme values over the past three or four decades is likely to have been followed by a corresponding multidecadal spin-up of the Atlantic gyre circulation. From the observed PE' differences between the centres of the two gyres, Curry and McCartney calculate that the long-term increase in the NAO index to the mid-1990s was accompanied by a 30% increase in the 0-2000 dbar eastgoing baro-clinic mass transport along the gyre-gyre boundary, from 50Sv (1Sv = 106m3 s—J) in 1970 to 65 Sv in the mid-1990s (Fig. 7.3.7, see Plate 7.3.7, p. 588). Both subpolar and subtropical gyres contributed equally to the changes in their transport index. Thus in response to the NAO, the North Atlantic gyre circulation during WOCE is likely to have been at its strongest for more than a century. Needless to say, as Curry and McCartney point out, reality is more complex than this simple partnership between the circulation indices of ocean and atmosphere. Belkin et al., 1998) had a temporary damping effect on transport as they passed through the Labrador Basin in 1968-72 and 1980-84 (see also Curry et al., 1998). 2 Though wind and buoyancy forcing did contribute to PE' changes in the subtropical gyre, the PE' history of that basin seems mainly to reflect thermocline 'heave' as a lagged low-frequency baroclinic adjustment to changing wind stresses further east. 3 Since advection moves the heat content anomalies around after their formation, the PE' pattern becomes a subtle quadripole rather than a dipole, with opposite dynamic height departures in the western and eastern parts of either gyre. Nonetheless, this neat and convincing synthesis of the observational record by Curry and McCartney does appear to justify the view that decadal change in the ocean may be the result of a coupled system, not merely the response of a passive ocean to a decadally evolving atmosphere; and they certainly emphasize the unusual nature of the Atlantic circulation and its mode waters during WOCE.